Attention all Vector Linux users! Submissions must be clean and not offensive in any way. No exceptions! All wallpapers must be released under a free license, like CC or LGPL. Submissions will be judged based on style, creativity, striking appearance, and quality. Submissions will be accepted in this thread. Non Vector Linux users are encouraged to participate and may send their works to dweeberkitty at gmail.com. Please do not post in this thread except to submit a wallpaper. No more than two wallpapers will be accepted by any one contestant. If you do not win, don't despair! This contest marks the beginning of a series of seven contests with the same prize. You may have a chance yet to win something! Here is a picture of the prize that could be yours! Re: Let the Contest Begin! Thanks for the submission. Remember it needs to be in TWO formats. Please also change your post to just include the links to the wallpaper so that when others begin submitting, this thread does not take forever to download. Thanks! This is just a reminder. The deadline for the contest is in ONE WEEK from today. Work hard on those wallpapers. You don't have much time! Again, another reminder, the deadline is tomorrow!!! I have not received any submissions yet. How many people are actually going to submit something? 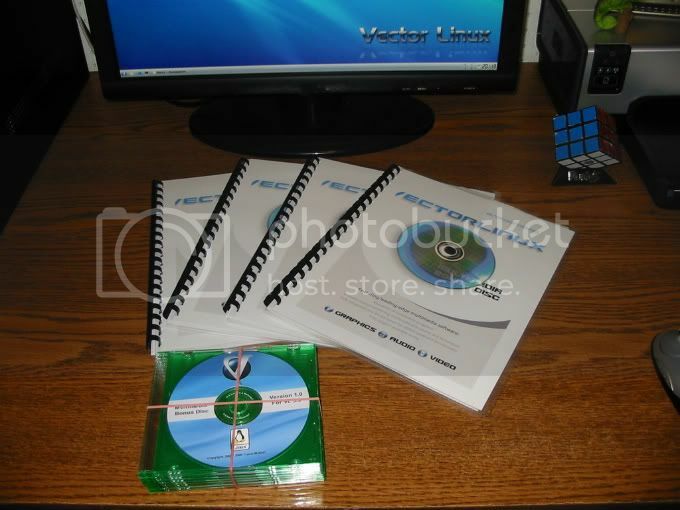 Remember, this is your chance to win a free Multimedia Bonus Disc for Vector Linux!!!! Looks great, Masta...love the "quiet spotlight" effect; feels like VL stepping out on stage to say "Hello" - not shy, but not overly boastful either - just confident. First place finish in my books!! I'll be happy to try to make one for Vector. I'm sorry I missed this contest. Er.. I just noticed the contest was 4 years ago :-O LOL.